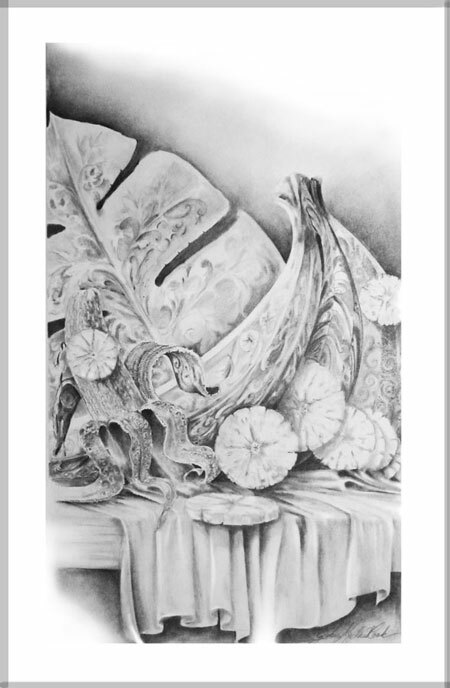 Fancy Bananas 11″x17″ Graphite on 2 ply smooth Bristol. 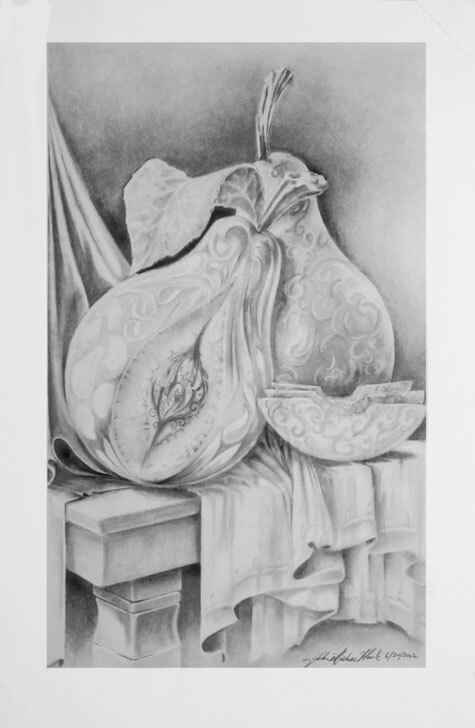 This image is the second of five in a set of fancy fruit graphite renderings, lightly inspired by how fruit tastes to me. I posted the Grapes last week in the “Drawing” Gallery with a similar story. Bananas are a “Toy” food; they have a nice texture. Banana taste is forever easily remembered and has a great after taste. Once you have them with peanut butter, their flavor is somehow enhanced, separated out by its combination. I think the aroma of a banana is more than an apple or a pear, whose aromas come with direct taste more than distant sensing. To me, the mighty banana has a place in the memory that spans from early childhood and playing with the peeling, to youthfully trying to just hold one without peeling it (an almost impossible task). Now who has actually seen a banana leaf, or tree for that matter? Small bunches, of course, can be seen at the grocery. I love slicing them, and playing with the peelings. Folding up the overcoat of a banana helps to hold the moment, and after many years of this relationship, I find them to be completely fun to eat, look at, handle, share, carry, set on the counter and anticipate. One day my wife found a “banana hook,” a most convienent place to keep them, and they now serve as decoration as well (they always did, I suppose). Banana consuming is like drawing or painting, you just have to do it. You can’t hold a brush or pencil in your hands without using it and you can’t hold a banana without eating it. If the color alone doesn’t invigorate you, the firm feeling of its 5 sided grinning body will. Even the rough end parts are not offensive (we know they will get pulled away and hold the overcoat flaps together for easy goofing around. I drew these banana abstractions from memory; the real leaves don’t have splits. Nothing is accurate except my feelings for them. I will paint them someday because it would be disrespectful to not include my favorite part of a banana-Yellow. This is also like Botany of Desire. (http://www.ted.com/talks/michael_pollan_gives_a_plant_s_eye_view.html ). Those tricky bananas have us trained to love them. Banana plants are used for high quality textiles and yarn. Used in kimonos and other clothing, as well as table cloths. The fibers of the plant make excellent art papers, banana paper dates back hundreds of years. Juice from the plant can be used as an adhesive. Large leaves are used as umbrellas, or food wrappers, or containers for storage. Banana peelings, when powdered, can filter and extract heavy metals from river water. Banana plants are herbs. Good for eating, cooking, and making many varied recipes like banana bread, ice cream, yogurt, cake, fruit salads and toppings, baby food, sliced and fried into chips. Fine strips of leaf edges have been used for centuries to make small threads for garlands and flower arrangements, bindings of all sorts and art projects. Bananas can be inspiring to artists. Bananas are “high value” school lunch trade items. Their leaf sheaths make a trunk like stem structure (Pseudostem). The plants have 8 to 12 leaves that grow up to two feet wide and 9 feet long. Bananas have about 75% water but are a good source of vitamin B6, fiber and potassium. Root systems can spread out 30 feet or more. 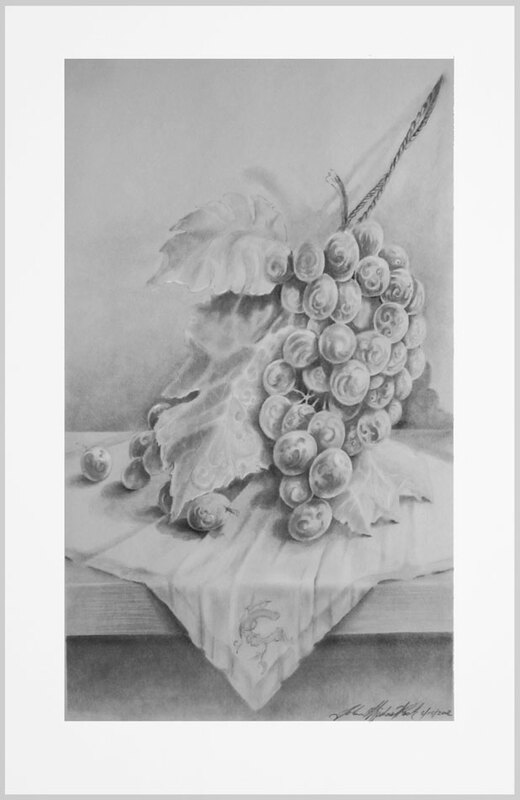 This entry was posted in Drawing and tagged bananas, Bristol board, drawing., Graphite on June 25, 2013 by eightdecades. 11″x17″ Graphite on 2 ply Bristol. Having taught a number of art classes over the years, a favorite quote, (of my own) became a standard part of my daily diatribe. “If you can’t paint an apple to look like an apple – how do you expect to have people trust your dreams when you paint them?” Now after many long years I realize that sometimes you can see from even a greatly abstracted form, the artist can paint their dreams or any thing they wish. It is in the way they render that portrays, or better betrays their hidden skills. It is not so much the moving of interests over time that keeps artists from painting their dreams, but more it is the changing of reasons to believe their work needs to be painted at all. Once seen in the mind, we often move on to the next dream, only capturing few sketches and random individual works as evidence anything was going on in the first place. It takes a lifetime to assemble a true picture of what the artist dreaming mind is doing, and then does it relate or have value? Most recognized artists attend to building a body of work that is desirable to a consuming public. The vast majority of artists do not achieve this or even attempt it; they just make art. After they are gone, others gather up the mess and say “Look what this person was doing,” if anything. Apples: Apples are known to be a member of the rose family. Apples are thought to date back 750,000 years. 25% of apples volume is air so they float. The average person eats 65 apples in a year. The most popular apple varieties in the US are: The Red Delicious, the Golden Delicious and the Granny Smith. There are 10 seeds on average in an apple. 50 leaves give their energy to produce one apple. 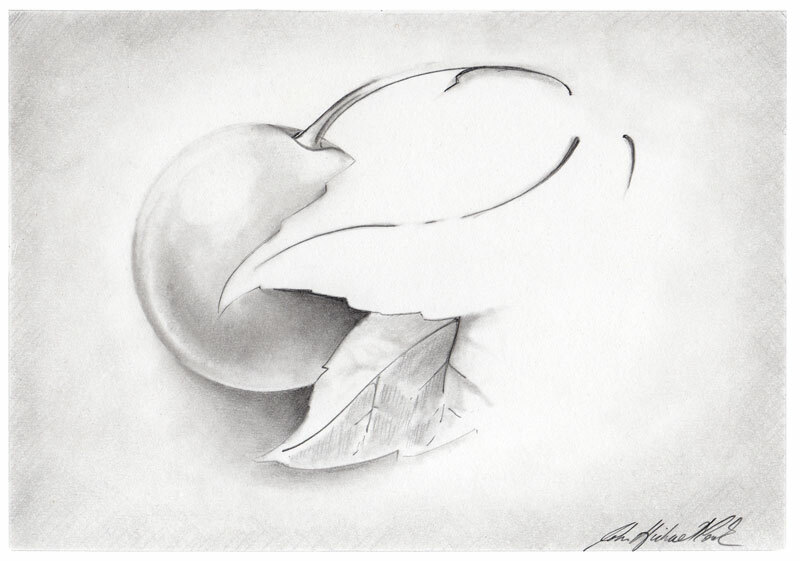 This entry was posted in Drawing and tagged apples, Bristol, drawing, Graphite on June 8, 2013 by eightdecades. Fourth of five images in Fancy Fruit renderings. The pear with its seed center exposed and bites sliced out is a mental image from childhood, perhaps it was the first time I saw a pear just becoming a treat! The overall flavor of a pear is curly and friendly and sensitive. It is easy to bruise a pear or dent its surface, and easier yet to eat. Unlike other fruit (except peaches), they don’t last long once you start, as they are wet and juicy and require either slicing or just starting on one side and going around to the other in one event, leaving only the core center and the stem. This drawing was also done entirely from memory and is not any more accurate than that. I realized after doing it that I had more of a peach seed in the middle as pear seeds are small and multiple. So given that, it is probably a new fruit invented by this artist and called a Pear. Again, doing this in black graphite on white bristol seemed better than a colored version. Perhaps it is because we have all been led into seeing memories in Black and White. Pears; In the U.S., most pears are grown on the west coast (about 95%): Oregon, Northern California, and Washington. Musical instruments, furniture, wood carvings, are often made of pear wood; it is also used to make wooden kitchen utensils as it doesn’t impart odor or color to the food. Pear wood is tough and will withstand many trips through dishwashing without splintering or warping. Because pear wood doesn’t warp, it also makes great architect’s rulers. In Europe, before tobacco was introduced, people smoked pear leaves. In the world today, over 3000 varieties of pears are grown. 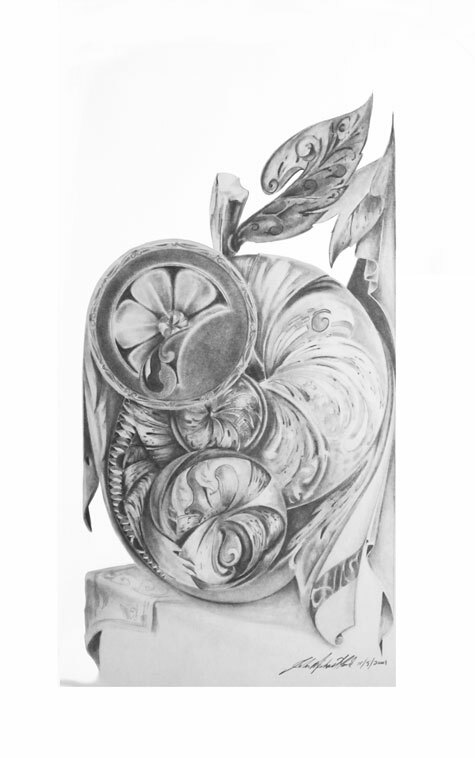 This entry was posted in Drawing and tagged drawing, Graphite, pears on May 31, 2013 by eightdecades. Fancy Oranges 11″x17″ Graphite on 2 ply smooth Bristol. Third of five images in Fancy Fruit renderings. Sliced, wedged, or just peeled and eaten, oranges have a taste that looks like tangy fun. The sections have a texture, and the fruity meaty part have a different texture. The cell sections have a slight resistance to being bit into. Fun to peel, fun to squeeze (but can be dangerous as choking hazards), oranges are not as much fun to hold as a banana, but are far more popular to compose in still life paintings. The surface of an orange is hard to render because of its bumpy, dimpled complexion. Most often, you will see one of two styles: a palette knife approach with broad, orange colored strokes defining shape and shadow, or a near photographic detailed painting showing off high skills in rendering. Anything in between these two styles is usually including an orange as a part of a larger composition where the overall image is created, rather than the personality of the individual fruit. I like all these styles too, but for my rendition of an orange it seemed to be more interesting to just make a black and white graphite image of a response to how they are perceived in memory. After chocolate and vanilla, orange is the world’s favorite flavor. Oranges came to the New World in 1493, on the Christopher Columbus voyage II. Of all the orange crop only about 20% are sold intact (whole). Orange juice, preserves, and extract comprise the rest. Florida is the number one producer of oranges in the U.S. & number two in the world. The name “orange” is not to name the color of the fruit. Originally, the Arabic word naranj was used to describe the fruit flavor. In English (wrong word division), the word became narange, and over time lost the initial “n” and the a became an O in the 14 century. Orange (the color of the fruit) was then used as a name for that color in 1540. So, the color got its name from the fruit, not the other way around. 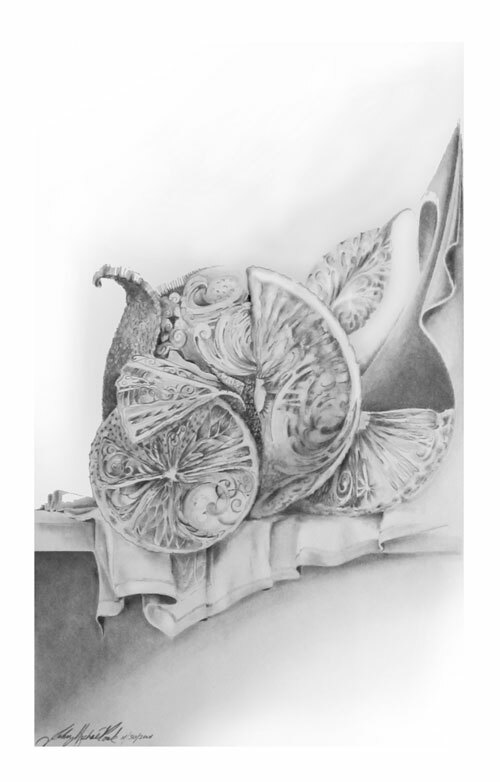 This entry was posted in Drawing and tagged Bristol, drawing, Graphite, Oranges on May 21, 2013 by eightdecades. One very hard thing for any artist to do is to justify or explain drawing a finished something for no reason, for no outcome, or even for no income. Especially when there are so many other works we intend or need to do, want to do, and have set ourselves to do. It is a great challenge to pick up a pencil, have the muse come and make you want to do a drawing that you just can’t say why you should, or what it means or even that it means anything at all. Like doing a cherry (when I know I should be doing the other thing I also wanted to get done). I do many drawings like that; actually, most of my work starts like that. This “cherry” is one of them. I have done enough like this that they may actually become a series. On the other hand (or mind), we get swept up in just doing a “cherry” drawing for no purpose. Then, at some point that sketch becomes a drawing and begins to demand some serious time in order to make it “good enough” to lift it up from a sketch, not discardable and not make you wish the time had been better spent. 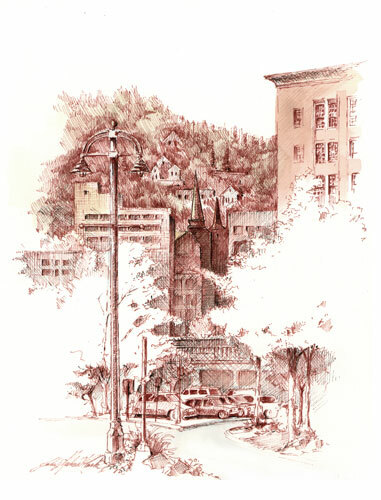 That is when that drawing becomes a rendering. One could write a whole book on that moment. Then several years or so after you have spent that time, stuffed it into a forgotten place, re-stumbled across it, you then decide to post it on the internet of all places. This “cherry” image has been stuffed in the bottom of a drawer beneath “good drawings” until rediscovering it yesterday, and I said, “There is my next post, I actually like this drawing.” I hope you do, too. So I have this stack of “time spent drawings” tucked away, and only a few of these will see the light of day. There are “better” sketches wishing to become renderings; they have their own sketchy personality and will probably forever remain as they are, too. Time spent will most likely be on new responses to the muse. Most often a sketch begins with a #2 “yellow” pencil. 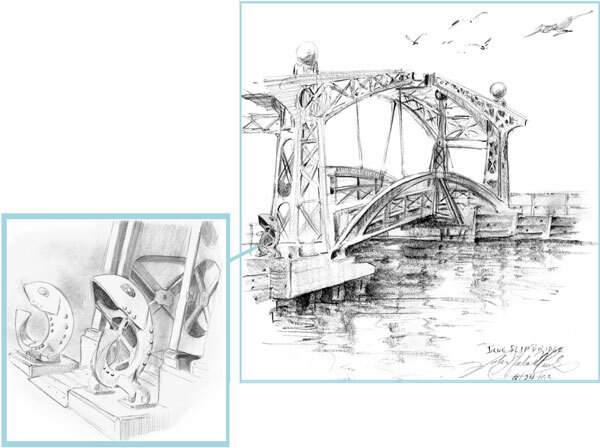 Using graphite allows a drawing to progress beyond a sketch, it can go the distance and hold up over time. So nowadays, as soon as I think a drawing can go the distance, I switch to a graphite or more expensive pencil tool, get on bristol board or illustration paper and continue. I have learned this; keep good paper and drawing tools nearby. 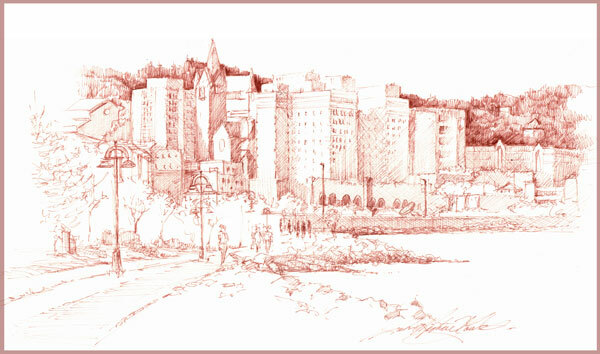 This entry was posted in Drawing and tagged berry, Cherry, Graphite, Pencil on April 15, 2013 by eightdecades.